Host a Festive Holiday Sweater Party with Goodwill! - Mamanista! Home > Beauty & Fashion > Host a Festive Holiday Sweater Party with Goodwill! I swear the days go by faster and faster every year. Here we are, in the midst of the 2013 holiday season and where did the year go? A fun way to commemorate holidays past is to host, yep, you guessed it, a holiday sweater party! 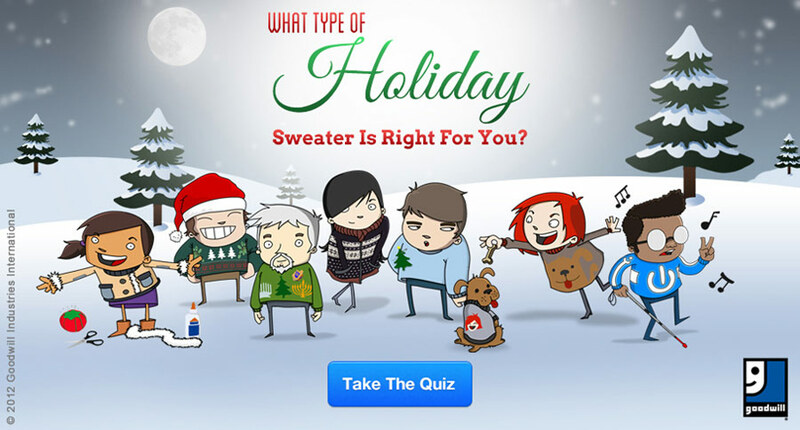 If you don’t have anything to wear, take this Festive Holiday Sweater Quiz: http://bit.ly/SweaterQuiz and head to your local Goodwill via our store locator at www.goodwill.org to find a holiday sweater that suits your unique personality! Of course, don’t forget that all of these donations are considered charitable tax-deductions, including the festive holiday sweaters that YOU are ready to let go. Through Goodwill’s locator tool, it’s easy for people to find their nearest Goodwill location, including stores, headquarters, job training centers and donation centers. And through Goodwill’s Donation Impact Calculator, you can see how every item you give has supported people who are seeking to earn jobs and build careers. Happy Holidays and we hope you have a fabulously festive holiday sweater party!